Thunderkick may have started small, but it has declared itself serious enough for the big league in more recent times and now their slots are available in a large number of high-quality crypto casinos. Two reasons for their success are their excellently designed video slots, and their functional advantages over the majority of today’s online machines. 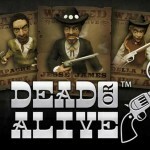 Arcader is one of their many great games on offer. Retro gamers will remember classic arcade games from the 80’s that kept us busy for hours on end. 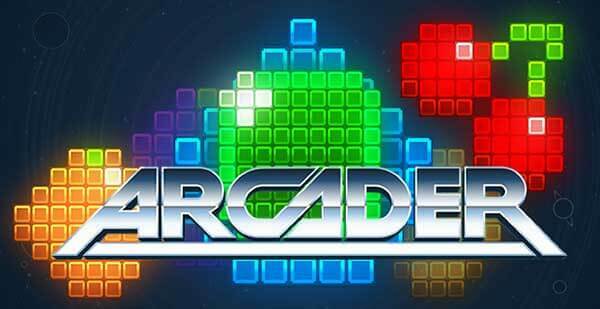 Arcader is full of nostalgic reference to games of the era, with its coarse pixel graphics and 8-bit music. The Arcader video slot has 5 reels with three lines of characters, although at first glance it may look like there are more. There are a total of 15 paylines and for one rotation on all lines you can bet between 20 cents and $100. Thunderkick stormed the market with their phenomenal slot functionality. In Arcader, the main character can be regarded as a Wild symbol. It appears on any reel in any amount, and performs the same function; to preclude other symbols to create a winning combination. In addition to the wildcard character there is an Expander symbol. This symbol appears in the form of two arrows, on the second, third or fourth drums and operates as follows: if for example on the first and third reels you have any image of cherries, but in the second reel you don’t, and there is an Expander, then this Expander takes over the entire second drum and transform all three characters in cherries. Thus, you get a winning combination of cherries out of nowhere. The same can happen with all other ordinary characters. Besides the Wild and the Expander, in Arcader there are also the Scatter and Bonus symbols. Their appearance mode activates the Free Spins as well as a Bonus game, but more on that below. To get 9 free spins, you need to hit the reels 3, 4 or 5 Scatter symbols depicting the letter “B”, which stands for Bonus. At the same time, if you get 3 of these characters, your 9 free spins will increase by 1 time, and if 4 or 5, then 3 times and 9 times respectively. If you hit Scatter symbols in the free spins mode, then you increase the multiplier, not the number of spins. Most interestingly, during free spins each Wild symbol that appears on drum 2, 3 or 4 remains on it until the end of this regime. 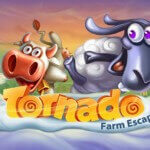 Thus, the most favourable will be the last free spins, resulting in a big win. This is why we love crypto casinos. Bonus characters in Arcader are presented in the image of the letter ‘M’, the mystical bonus. This mode is activated by using 3, 4 or 5 bonus symbols. The difference between them is that each symbol will be given in the X1, X2 and X6, with respective winnings. The Mystic bonus game works as follows: you will have 15 closed positions in front of you. In two of them a cross will be hidden, which will end the round. Your task is to open the other 13 and win the round. The maximum rate of multiplication to the most expensive symbol is 108X! Only the character value is limited in Arcader. In the best Bonus game scenario, at a rate of $100 you can win $32,400! The best Free Spins game would bring you $270,000 when hitting all 9 to 15 of the most expensive characters. It just depends on your luck and bet size. In conclusion, the Arcader video slot is one of the best slots available worldwide. 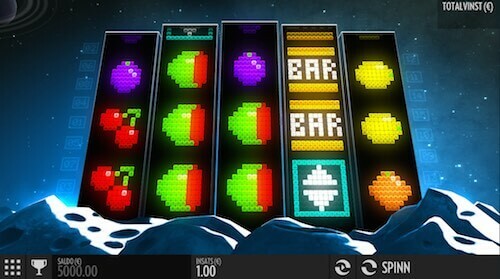 This online machine offers cool retro graphics and 8-bit tunes that take you back to gaming in the 80’s, as well as an interesting bonus game and free spins mode. 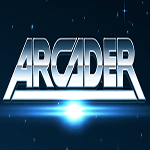 You will be greatly entertained by the functionality that Arcader has to offer its players. Play and win with this truly unique slot at the best Australian and European casinos: Dunder, Leo Vegas, Casino-X.